A TWENTY FOOT TALL ROBOT TREE HOUSE IN THE DEEP WOODS OF VERMONT?? 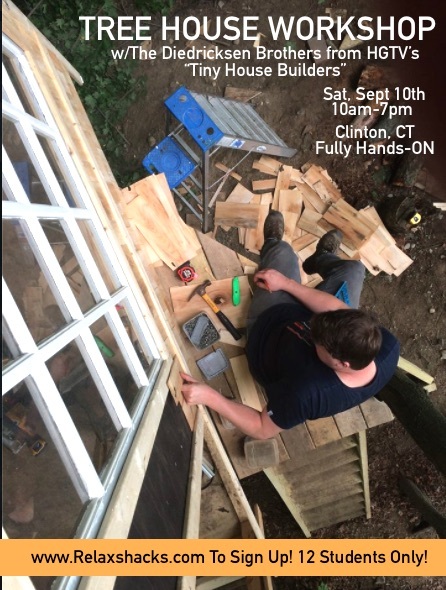 "Its just something I always have wanted to do, and have messed with ink sketches of for years", reported builder/designer Derek "Deek" Diedricksen, when asked as to why he had chosen such outlandish, or even other-worldly, subject matter for his latest hands-on tree house workshop. "Why the heck not? 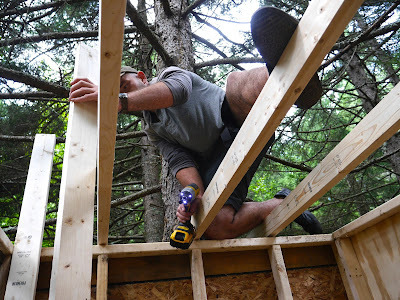 Its fun, different- I mean, I've NEVER even heard of anyone doing something like this- and the people who attended the three day workshop get the bragging rights to one hell of a 'look what I built over the weekend' story. While most stayed at home, playing video games, or watching tv re-runs with their Cheetos-stained hands, we were off-grid in the woods crafting an enormous tree house robot!" 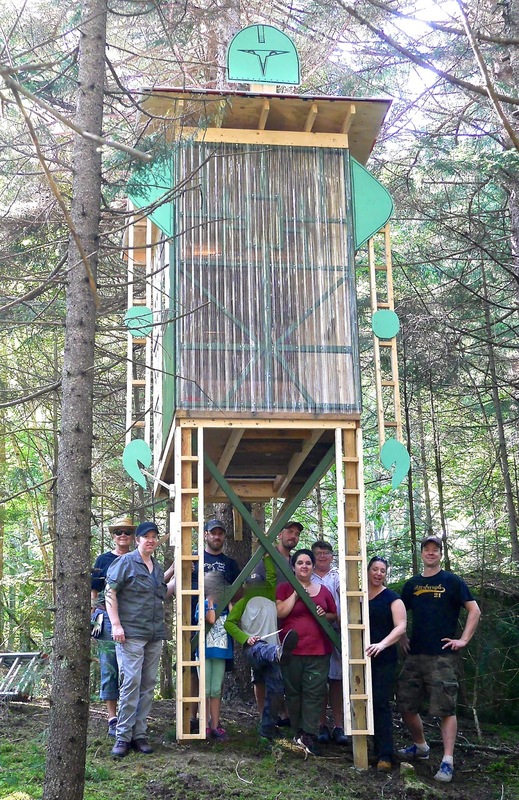 The structure, standing at just OVER twenty feet in height, was completed in just three days, while setting aside time for talks and instructions on technique. Furthermore, Diedricksen claims that with the aid of salvaged and recycled materials, it was built for well under $1000.00. "While this thing is just huge, we also intentionally built the trail approaching it to arrive at this monster from a downhill vantage, making it seem even larger! ", added Diedricksen. "It also lights up at night because of the clear Tuftex polycarbonate panels that we sided its front with. We even went so far as to build in a lantern-hook for the center of its chest. 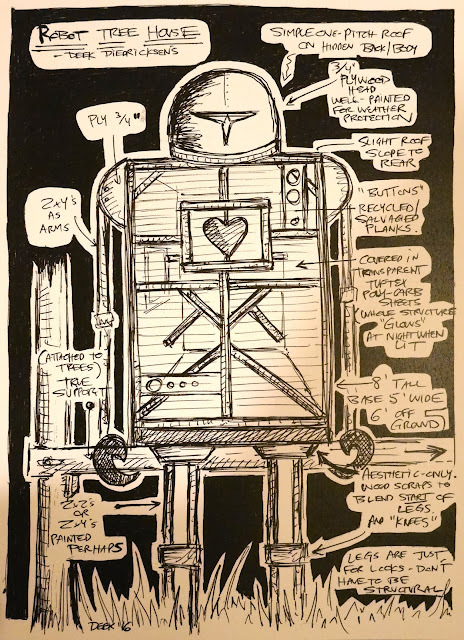 At night, it'll appear as if this huge creature has a glowing power source in its wooden sternum- a 'robot heart'". That polycarbonate will also let us bring natural light into so small a space, while letting us achieve that nighttime glow that'll put this thing over the top!" 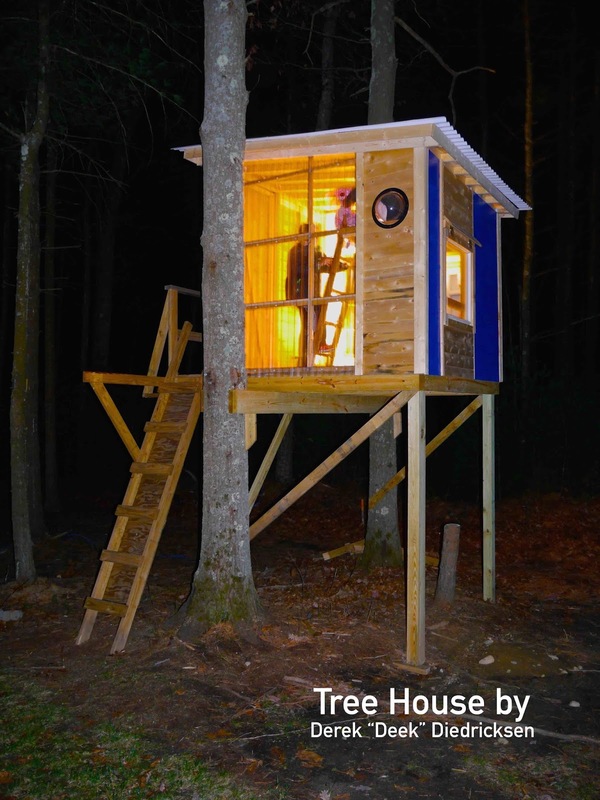 He went on to add, "While most of my tree houses are whimsical and usually identifiable by those clear Tuftex walls I employ, I'm thinking that this one has to take the cake in terms of its bizarreness, and I'm pretty happy with it for just that reason." "We're trying to wrap up this build and design of mine, then one for a new show we're helming called "The Micromen" (with brother Dustin), and then I MIGHT, MIGHT take on one last tree house this season before winter hits. Its tough to say 'No', as I absolutely love working on 'em".